Have you made Bananes Flambees? 1. Melt butter in a pan. 2. Add sugar stirring and scrubbing orange peel against bottom of pan to caramelize. 3. 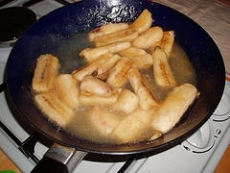 Place bananas in pan. Add orange juice and turn down heat cook until sugar has dissolved. 4. Flambe with cognac (optional) Stir in Grand Marnier liqueur Arrange 1 scoop ice cream on each individual plate. 5. Top with whipped cream Sprinkle cinnamon on top of cream Divide bananas among the plates and pour sauce on top. This recipe contains potential food allergens and will effect people with Banana, Butter, Natural Sweeteners, Alcohol, Oranges allergies.